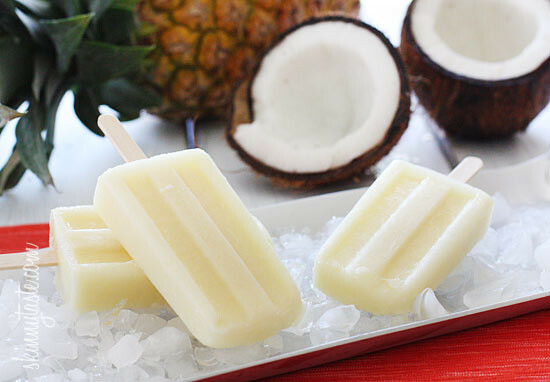 Easy Piña Colada Ice Pops, made with pineapple, coconut milk and a splash of rum will whisk you away on a tropical island with every bite you take! Head on over to Dash Recipes for the full recipe where I will be contributing a skinny dessert once a month. For those of you following Weight Watcher Points Plus, only 3 Points+ each (2 without the rum) or 5 Smart Points. 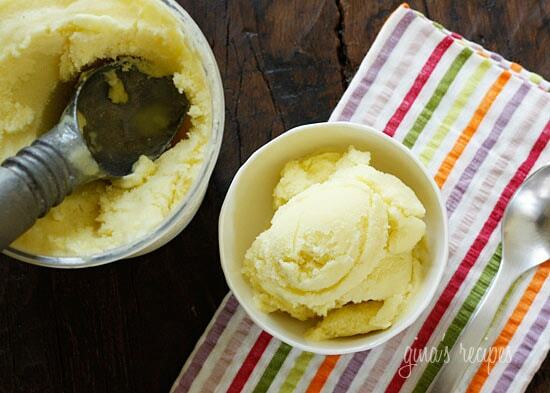 Summer is great for luau themed parties, another fun dessert you can make this summer if you have an ice cream maker is this yummy Piña Colada Sorbet; serve it in hollowed out coconuts for a cool presentation. 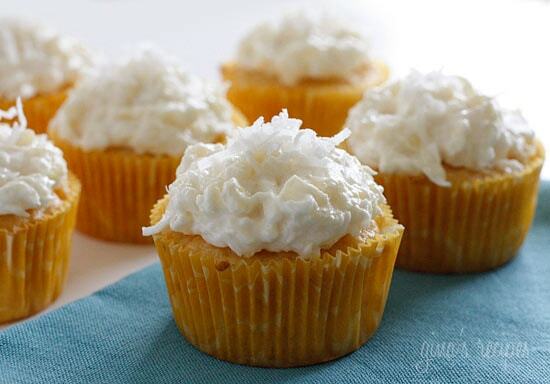 If it’s cupcakes you crave, then these ever so popular Skinny Piña Colada Cupcakes are quick, easy and always a crowd pleaser! Stay cool and enjoy your weekend! I don't love pineapple flavored things (though I love fresh pineapple, go figure), but these sound so refreshing and perfect for summer! Yum! My boys and I love making homemade popsicles in the summer. Thanks for the amazing recipes and helping me to get back into shape after the birth of our sixth son! Yum! I love pina cdolada. All these sound delicious!! Looks delish! Pina Colada is one of my favorite combos. Enjoy your weekend!! Oh how perfect for summer! I love pina coladas, but not the calorie count – thank you for making my summer evenings more fun! The ice pops sound delicious. Wish I could try one now. The pina colada pops look so good! Perfect for the heat wave we've been having. These look great! An awesome presentation.